What to do when your product kills someone. Tesla is in a pickle today. It has a product feature that has killed its user. Now Tesla has to walk the fine boundaries between legal defense, public relations sensitivity, technological defense, and moral culpability. The National Highway Transportation Safety Administration (NHTSA) has opened an investigation into the circumstances surrounding the death of a Tesla motorist employing Tesla’s much hyped Autopilot feature. The motorist was cruising on a divided highway when an oncoming tractor-trailer made a left turn in front of it, clearing enough space that the cruising Tesla drove right under the trailer, removing windshield (and one would assume killing the inattentive drive instantly at that moment) before continuing to cruise into several more collisions. A diagram of the accident is here. It’s a straight up oncoming left turn–not some freakish move by another motorist that could not have been judged. And, the Tesla drove right through the truck without seeing it. Now, there are a few issues related to the use of new technology that come to mind here, namely that there are risks to using new technology in general, and in particular when it involves moving your body at high speed. The first people to fly in airplanes faced a much higher risk of death than those of us who partake of air travel do today. It’s part of the process. But… When the technology is uniformly hyped, results in a fatality, and then its purveyor only defends the technology, then the purveyor is on the hook. That is a mouthful that basically says “use at your own risk.” And, that’s fine, but to place “public beta” software in charge of multi-ton hunks of metal and plastic moving at 90 feet per second seems a bit…aggressive. And so I’m betting Tesla will face a bit of backlash about the technology. And, this is fine, but it’s also indicative of a marketer or PR person using statistics–not a person who understands the stats themselves. First off, let’s remove from the 130 million miles cited the mileage merely using active cruise control, because as I understand it those miles are aggregated in there. That is sure to be a LOT. That will leave the mileage that Tesla’s are being used with “autosteer” engaged. That is the technology in question. That means that this fatality came with far fewer miles driven than the company claims. Second, the company is appealing to the base rates of fatalities as evidence that Teslas on “autosteer” are safer than other cars; but the base rates used are highly misleading. Okay, so there is a fatality in the U.S. every 94 million miles driven. That’s fine; but it includes, for instance, people who die from overloading their 1978 Ford Pinto and then losing control after a blowout. It includes drunk drivers. It includes people driving old cars, and cars with mechanical deficiencies, and cars with bald tires. It also includes fatalities where the driver was killed by the negligence of other drivers–not simply their own. In short, it’s not a base rate that’s comparable for Teslas driven by sober drivers on divided highways. That rate is different, and likely less flattering for Tesla. The correct base rate starts with the rate of fatalities of people driving brand new luxury automobiles. And, that matters. 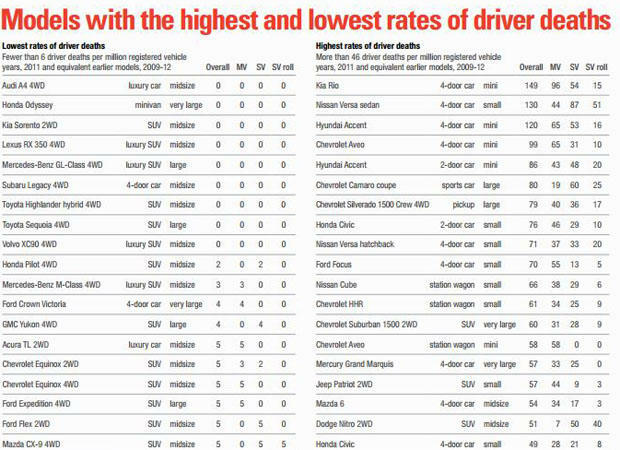 In the chart below, you see the car models with the lowest driver death rates, and the models with the highest rates. Tesla isn’t in league with the Kia Rio or the Hyundai Accent (two cars that happen to have drivers who die at high rates). To suggest it is so is to pad the PR. The correct base rate also includes cars on divided highways, and where the dead driver was the inattentive one who drove into an avoidable accident. Second, I’m betting that Tesla drivers, like the one in the unfortunate crash incident, are using this nascent technology and expecting that it will not run them broadside into a tractor trailer. The hyperbole surrounding the tech, and the feel good ego boost of owning a six figure investment in new technology, likely clouds judgment. As someone who is a fan of the prospect of self driving cars but who had no idea the aggressiveness of Tesla’s placement of this technology onto actual roads, I’d say it’s time for them to go back to the drawing board. One fatality does not make a new product category go away, but Tesla faces a very fine line between legal defense and technology evangelism. When your product kills someone, especially when it kills someone during a routine circumstance where the technology should have obviously worked, resorting to bad statistics and legal disclaimers is a bad idea. The right thing to do is to fix the technology, not to spin its goodness. As always, caveat emptor. And be careful out there. Are You Well if Oil is Not Well? 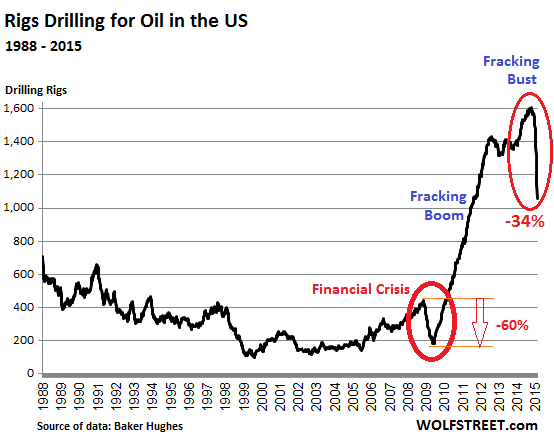 The jolly crew of optimists at ZeroHedge, quoting some of their stable of doomsayers, are predicting that the oil crisis is just beginning… And I find it worth reading. What does your business look like in the age of an extremely strong dollar, a Euro depreciating against all other global currencies due to EQE, and oil at $20 a barrel? Tough question, eh? Well, I’m not one to call the price of oil…If I were I’d be in a different line of business; but I am one to encourage clients and executives to look at the world through multiple lenses. The lens that is most interesting right now is the one that includes a dramatic re-set of oil production both domestically and abroad, along with a healthy heaping helping of the knock-on effects that will impact consumer and B2B markets geared to this phenomenon. Remember, you don’t have to sell into oil exploration and production to feel this wrath…you only need to be near people and companies who do. Their risk is your risk. Stay ahead of it. Stay tuned. Your comments are welcome. http://www.wilsongrowthpartners.com/wp-content/uploads/2014/12/Blog55.jpg 450 800 Geoff Wilson http://www.wilsongrowthpartners.com/wp-content/uploads/2016/06/wgp-logo.png Geoff Wilson2015-02-16 18:39:212016-09-08 15:36:20Are You Well if Oil is Not Well? Great leaders, regardless of the arena they lead within, share one absolutely essential trait. It is, without a doubt, one of the most satisfying things to hear from one’s leader. Such is the embodiment of the single trait–and it is a trait–that differentiates great leaders from all the also-rans. Great leaders underwrite the risks their people take. It’s the essence of great leadership. It encourages, extends, and drives people to levels of performance that the individual would not have thought possible. In the financial world, the underwriter is the one who bears the residual risk of non-performance. Underwriters back insurance, loans, mortgages and equity offerings. The word derives from the 17th century birth of the insurance trade. In those early days, members of the Lloyd’s of London insurance market would write their names under (therefore underwrite) the risks being undertaken by ventures (usually ship voyages) that they would insure. The underwriters, in exchange for a premium, backed the risks they underwrote. Because of this insurance, shipping companies were freer to engage in commerce individually than they otherwise would be. That’s what great leaders do. They explicitly backstop the risks their people take. Sure, they extract a premium from their teams in the form of performance and value. And, sure they don’t underwrite all risks. That would be absurd. But, they provide cover…protection…a backstop. And, their people know it; because it’s explicit. Great leaders underwrite the risks they ask their people to take. In doing so, they quite literally enable people to accomplish more than they could alone. Why does the backing of a leader allow for out-performance by followers? It inspires confidence – Dwight D. Eisenhower, in his letter to the Operation Overlord troops prior to the D-Day invasions in Normandy in 1944, told each man of his “full confidence in [their] courage, devotion to duty, and skill in battle.” Confidence is a tremendous asset when pursuing risky ventures. It encourages action – Leadership underwriting allows people to try new things more easily. Think of it as the social venture capital of innovation and initiative. It encourages stretch – Like the safety net for an acrobat, leadership underwriting allows for a more complete exploration of one’s talents. It encourages people to take on stretch roles. It neutralizes doubt – Doubt can be healthy. Doubt can be paralyzing. A strong leader underwriting his or her people takes the doubt and bundles it up; like any good insurer does. Eisenhower knew the risks he had asked his troops to take, and stood ready to take the blame in the case of failure. So, how do you know if the risks you take are being underwritten by your leader? The answer to this one is easy. Ask yourself one question. Do you feel that you are freer while within the sphere of influence of your leader, or do you feel that you have more freedom outside of it? Because, put simply, it should not feel freeing to leave the sphere of a great leader. Because they have your back. One of the most important choices we all will make in our careers is the choice of risk sharing relationships between us and our people and between us and our leaders. How we apportion risk between ourselves and our teams or allow it to be apportioned between us and our leaders essentially shows how much we respect our people and ourselves. Try it today… Underwrite somebody’s risk. A Reuters report today outlined a “cyber espionage” ring focused on stealing insider information for use in stock market trading. In an interesting and not so surprising approach to targeting, the spies sought email addresses and passwords of individuals most likely to have insider access. Cyber security continues to be a critical element of any company’s strategy. The question will be how to maintain a level field in the capital markets with this sort of thing going on in the background. Like cockroaches, confidential information leaks are typically far broader than the ones you see; and the key to security is not to have a low incidence rate, but rather a zero incident rate. How does secrecy and confidentiality affect your enterprise? Geoff Wilson http://www.wilsongrowthpartners.com/wp-content/uploads/2016/06/wgp-logo.png Geoff Wilson2014-12-02 19:30:002016-09-08 15:24:08How Safe are Your Secrets?